When the zippers are new, they are a little stiff. Be sure to grip the zipper pull closely to the zipper slider – if you do this and gently guide your zippers around corners, then your bag will last A LOT longer than if you simply grab the pulls and yank! Step-by-step instructions and photos here. 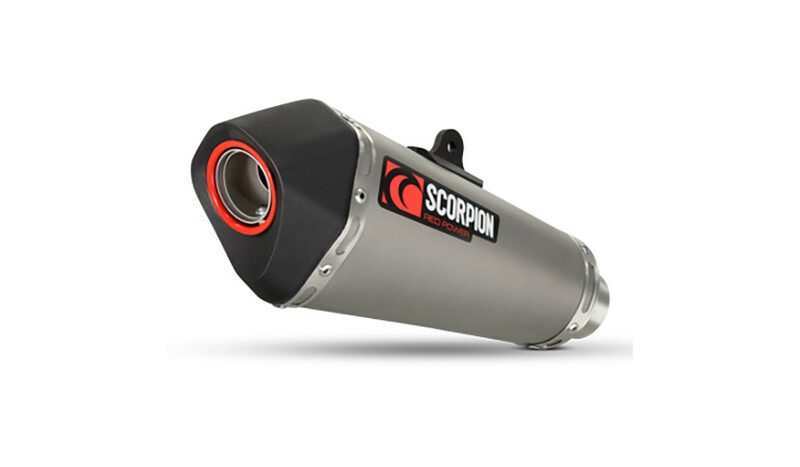 The Scorpion Serket Taper Exhaust fits Honda CB500F, Honda CB500R and Honda CB500X models, delivering a 1.1 HP gain, a 3.7 lb weight savings and only a slight increase of 1.5 dB in noise versus the large, heavy stock exhaust on the Honda CB500. 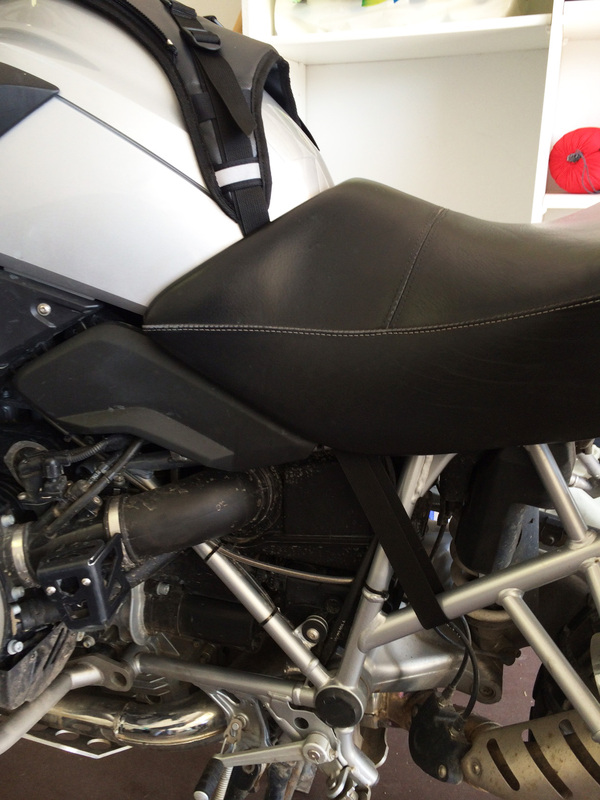 It also eliminates the stock flared exhaust shield, which can be in the way of riding boots. The Scorpion Serket Taper Exhaust features a unique precision formed, 6-facet profile and an aerospace derived multi-composite ‘Claw Contoured’’ outlet. The Scorpion Serket Taper Exhaust also features a tempered/fused sleeve seam with compression coined ends and a GP-style double spring mount for easy “slip-on” installation. 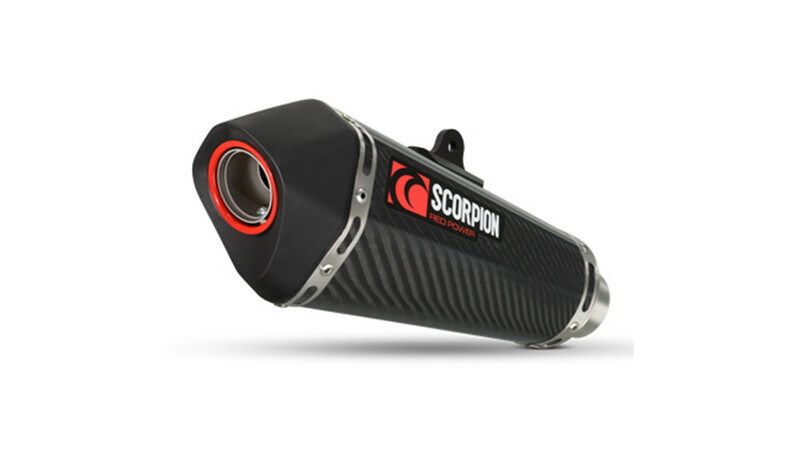 The Scorpion Serket Taper Exhaust is available in Stainless Steel, Carbon Fiber and Titanium models. Ride with confidence knowing that Scorpion Exhausts offers a Customer Damage Guarantee: crash and damage the Scorpion Serket Taper Exhaust, and they will offer a 50% discount on a replacement. 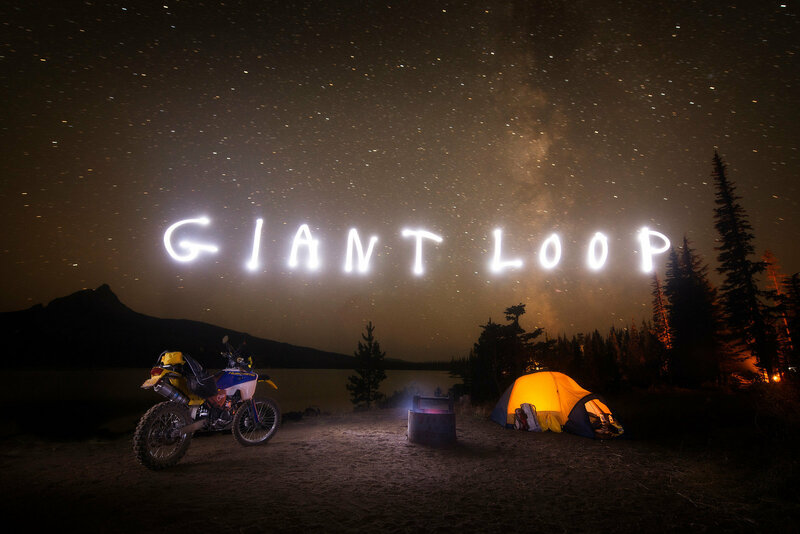 Overview video of most of Giant Loop’s entire product line for 2016. Giant Loop Adventure Proof Packing Systems & Gear on display in our vendor stand at the BMW MOA Riders of Oregon’s Chief Joseph Rally last weekend. Video overview of Giant Loop’s Ochoco Enduro Tail Pack. Ochoco Enduro Tail Pack straps to virtually any rack. Bolts onto dirt bike rear plastic fender or tail rack. And it’s not coming off! Or use the Ochoco Enduro Tail Pack unmounted as the ultimate goggle bag (fits 2 pair), tools, tubes, gloves and gear bag and throw it into your saddlebag. A DSLR camera or GoPro camera and accessories also fit great. Less is truly more – on many rides this is all you need. Take the weight off your body and put it on the bike. Go light! Go fast! Go Far! Video overview of Giant Loop’s Klamath Tail Rack Pack. Like a tank bag for the rear of bike, the low-profile Klamath Tail Rack Pack keeps gear organized and easily accessible, securing to virtually any motorcycle tail rack. The 4-liter soft luggage case features a zipper-less nested clamshell design inspired by classic motorcycle rally racing packs. Includes waterproof inner liner Dry Pod. Made in USA and constructed with military-spec materials, the Klamath Tail Rack Pack is backed by a Limited Lifetime Warranty. Video overview of Giant Loop’s Rubber Boa Straps. Confidently put the squeeze on a spare inner tube, tools, water or other essential gear with Giant Loop’s Rubber Boa Straps—hooked to dirt bike fenders. Rubber Boa Straps apply dynamic tension with stretch elastic shock cord and a simple locking slot, creating a dead-solid connection between plastic fenders and relatively small and lightweight gear, even in demanding off-road terrain. Available in a package of two. Video overview of Giant Loop’s Traveler Shoulder Strap. The Traveler Shoulder Strap is Giant Loop’s universal clip-on luggage strap for hands-free carrying to your hotel or campsite. Clip it to your Columbia Dry Bag and you have two straps for a backpack carry for adventures off the bike. Can be used with Giant Loop’s Rogue Dry Bag, Tillamook Dry Bag, Kiger Tank Bag, Fandango Tank Bag, Diablo Tank Bag, Siskiyou Panniers, Great Basin Saddlebag, Coyote Saddlebag – and just about any other bag. Video overview of Giant Loop’s Tracker Packer. Working in conjunction with 4-time Baja 1000 winner Quinn Cody and the Kurt Caselli Foundation, Giant Loop developed the Tracker Packer for SPOT Gen 3 to help keep off-road racers safer. 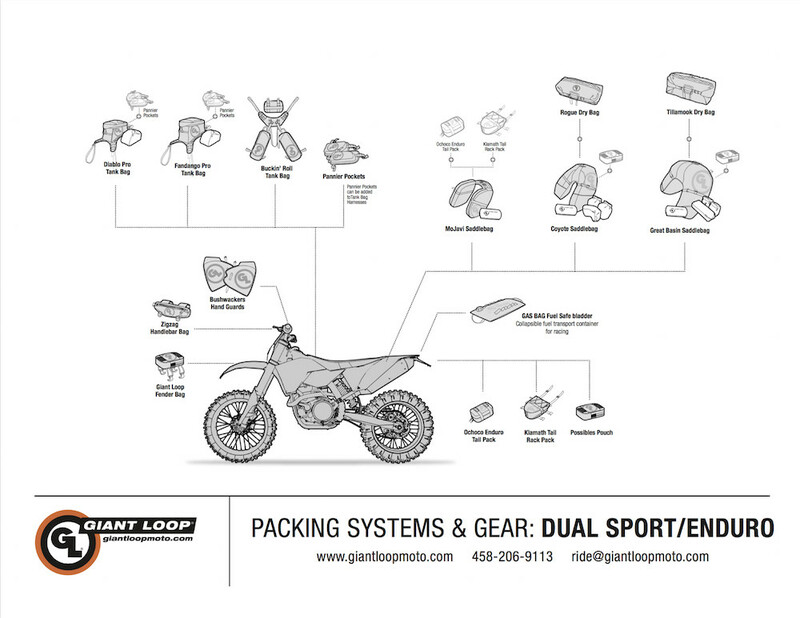 Giant Loop will donate a portion of all sales of the Tracker Packer for SPOT Gen3 to the KURT CASELLI FOUNDATION! Stay safer in the backcountry during all of your outdoor adventures; motorcycling, snowmobiling, hiking, backpacking, climbing, biking, boating with help the push of a button away. The super rugged and secure Tracker Packer firmly attaches the SPOT Gen3 device to your pack’s shoulder strap, handlebars, fork tube, arm or many other locations. Video overview of Giant Loop’s Tillamook Dry Bag.The 100% waterproof Tillamook Dry Bag (38 liters) is designed to attach to Giant Loop’s Great Basin Saddlebag and Siskiyou Panniers. But it can be secured on virtually any motorcycle make or model, making it indispensable equipment for a broad spectrum of on-road and off-road motorcycle riders. Without unstrapping the Tillamook Dry Bag from the bike, gear can be accessed from two ends. Two beefy reflective daisy chains provide plenty of secure attachment points. The Tillamook Dry Bag is named for the Tillamook State Forest, one of the wettest, greenest parts of Oregon — and renowned for its technical dirt bike riding. Video overview of Giant Loop’s Rouge Dry Bag. 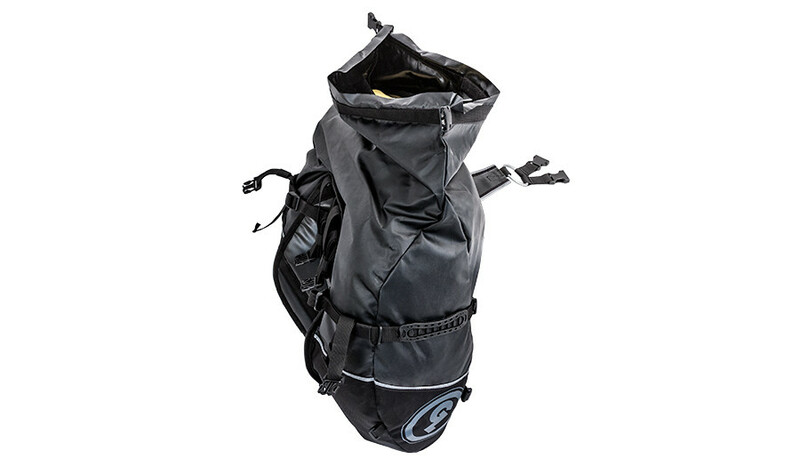 The 100% waterproof Rogue Dry Bag (17 liters) is designed to attach to Giant Loop’s MoJavi Saddlebag, Coyote Saddlebag, Great Basin Saddlebag and Siskiyou Panniers. But it can be secured on virtually any motorcycle make or model, making it indispensable equipment for a broad spectrum of on-road and off-road motorcycle riders. Video overview of Giant Loop’s Siskiyou Panniers. Giant Loop’s Siskiyou Pannier waterproof soft luggage combine the convenience of hard panniers with all of Giant Loop’s performance advantages. Rugged, rackless, lightweight and stable. Secures to passenger footrest mounts and rides on rear rack and/or pillion seat. Flexible internal framesheet conforms to array of racks and motorcycle makes/models. 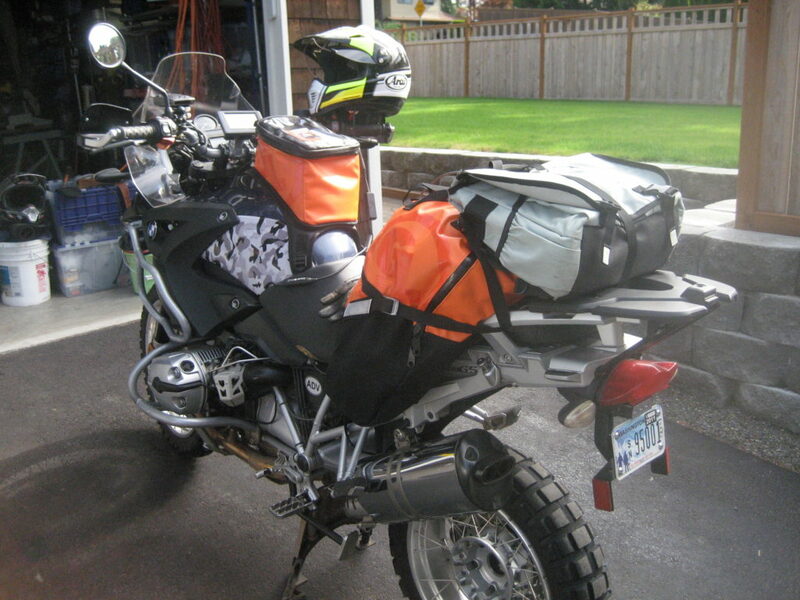 Cross-over wings create luggage platform for Dry Bags and gear, add stability and protect seat. Mounts/dismounts in minutes. Ride 2-up with a stadium cushion or Airhawk for passenger comfort, or consider Giant Loop’s rack mounted Round The World Panniers. Backed by a Limited Lifetime Warranty. Video overview of Giant Loop’s Fandango Pro Tank Bag. Fandango Tank Bag PRO™ (8 liters) represents a major upgrade of Giant Loop’s popular tank bag. Expandability, electronics compatibility, and features driven by rider feedback inspire this Adventure Proof state-of-the-art design. Video overview of Giant Loop’s Kiger Tank Bag. Zipperless nested clamshell lid quickly opens and closes with gloves on! Designed for bigger adventure touring bikes and riders carrying camera gear and electronics, the 9-liter Kiger Tank Bag is the largest member of the Giant Loop tank bag family, with a generous touchscreen-friendly map pocket that fits many tablet computers and mobile devices. Yet, it’s slim and trim for standing on the pegs riding off-road. Includes removable waterproof* inner liner Dry Pod for wet conditions protection – better than cumbersome rain covers that fill with air and fly off. Video overview of Giant Loop’s Possibles Pouch. The universal Possibles Pouch™ adds 2-liter easy access storage capacity to Giant Loop saddlebags and panniers — and any other secure attachment point on virtually any motorcycle make or model. Includes 2 webbing and thumb-lock buckle straps. Video overview of Giant Loop’s Pronghorn Straps. Every motorcyclist needs a handful of these multi-purpose, stretch polyurethane straps with virtually unbreakable fasteners. You’ll find a million uses for these quick, solid, tough straps. We’ve been using them for years to secure everything from luggage to water and fuel bottles to our Bushwackers Hand Guards. 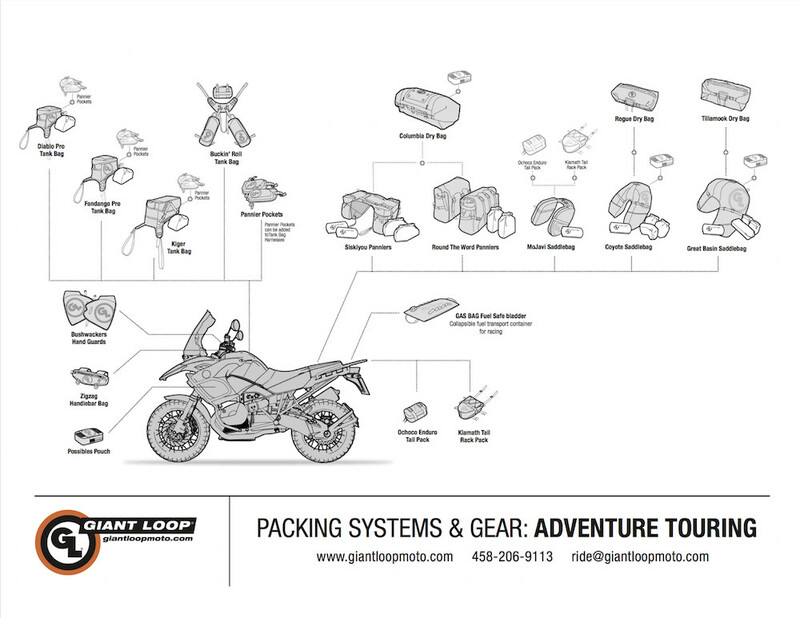 Video overview of Giant Loop’s Buckin’ Roll Tank Bag. Named for saddle pads used by rodeo cowboys, our most minimalist tank bag is perfect for riders who “don’t like tank bags.” Completely re-envisioned and redesigned for 2014, the Buckin’ Roll Tank Bag now fits virtually any motorcycle — and keeps all the essentials handy and out of the way when standing on the footpegs. Video overview for Giant Loop’s Diablo Pro Tank Bag. Diablo Pro Tank Bag (4 liters) rider-friendly features are similar to its larger cousin, the Fandango Pro Tank Bag, while remaining true to its minimalist, slim, trim design. Even when standing on the footpegs and riding off-road and trails, this little devil never gets in the way! Video overview of Giant Loop’s Mojavi Saddlebag. Take a load off with the MoJavi Saddlebag! 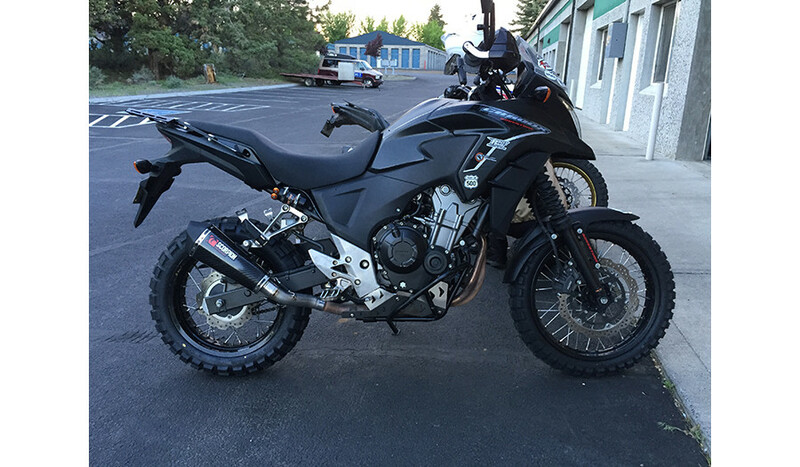 Improve rider endurance and comfort by taking the weight out of a backpack and putting it on your dirt bike, dual sport or supermoto motorcycle. Specifically designed to carry just the essentials needed for a day trip or trail ride, the MoJavi Saddlebag is the slim, trim bag for inner tubes, tools, fluids and other “save a ride” necessities. Straps on. Stays on. No matter what. Video overview of Giant Loop’s Bushwacker Hand Guards. Droppin’ into the weather? Combine Bushwackers with rigid hand guards/deflectors and heated grips for the ultimate protection against the elements. Ride safer and longer with warm, dry and clean hands and controls. Video overview of Giant Loop’s Great Basin Saddlebag. We pioneered the concept of the horseshoe-shaped, biomorphic motorcycle saddlebag design with our original Giant Loop Saddlebag, and the Great Basin was introduced in 2009 as a virtually universal soft luggage solution, fitting almost any motorcycle make/model designed to carry a passenger. 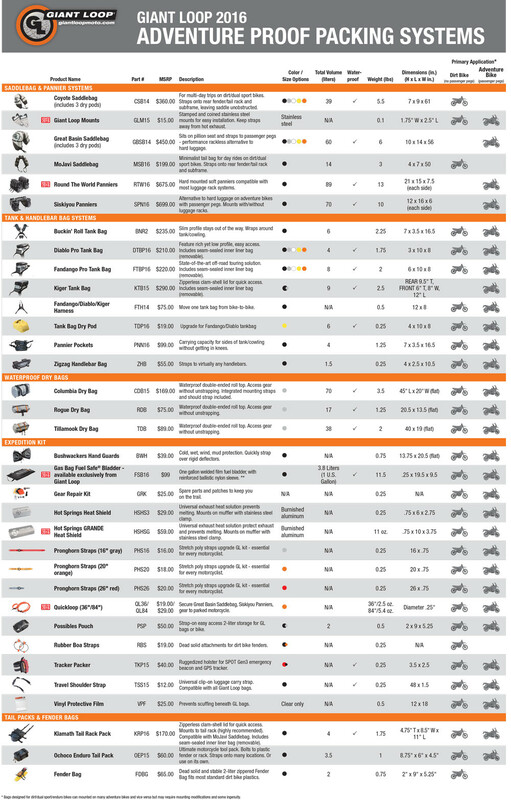 Here’s an overview of our Zigzag Handlebar Bag, which fits virtually everything with handlebars – motorcycles, snow bikes, snowmobiles, ATVs, side-by-sides, mountain bikes – plus it straps to engine guard, racks, bumpers, backpack straps and more! * Wash the Saddlebag with warm, soapy water, give it good rinse and let it air dry. Dirt and dust particles are usually the biggest challenges for zippers. * Lubricate the zippers. 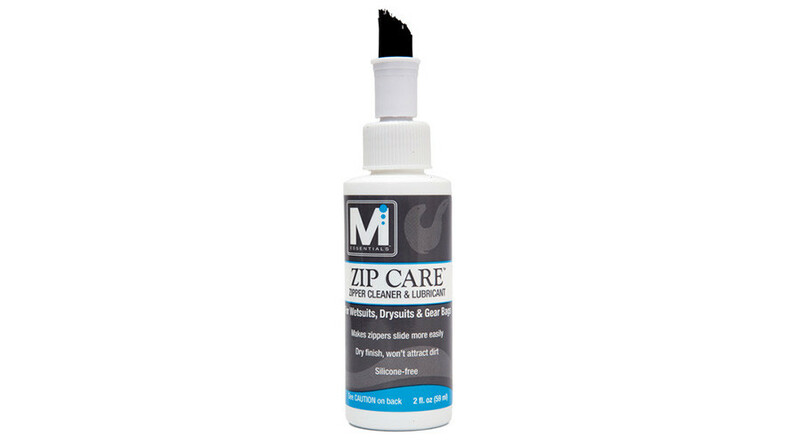 There are commercially available zipper lube products, but often a little soap, wax or even lip balm will help. * When you get into the bag, first roll the storm flap back out of the way, then roll the flap back over the zipper to keep it protected after you close the bag. * Avoid over packing. 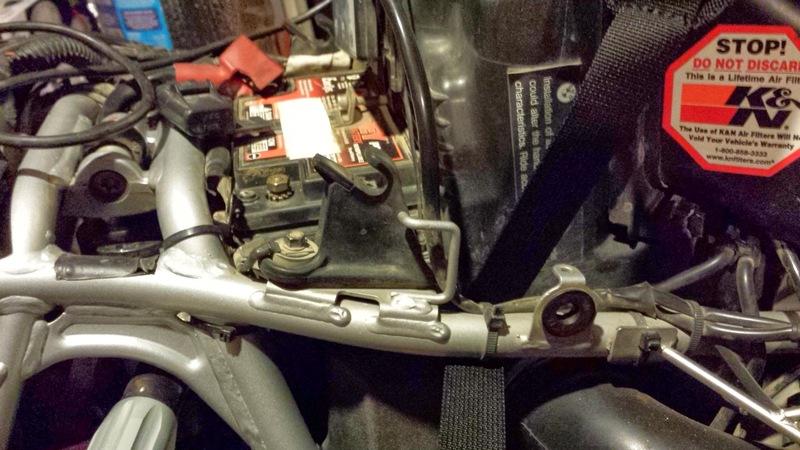 When the Saddlebag is not stuff drum tight, the zippers are much easier to manage. Consider using our Possibles Pouches to add external pockets, or a Rogue Dry Bag to expand the Saddlebag – compartmentalizing gear makes it easier to access the things you need during the day of riding and helps prevent the zipper from buckling being tightly stuffed. If you’ve tried everything, then there is an outside chance that you got a defective zipper. If you think this is the case, please print, fill out and include a copy of the attached warranty and repair return form with your CLEAN bag. Use RMA # [today’s date]. 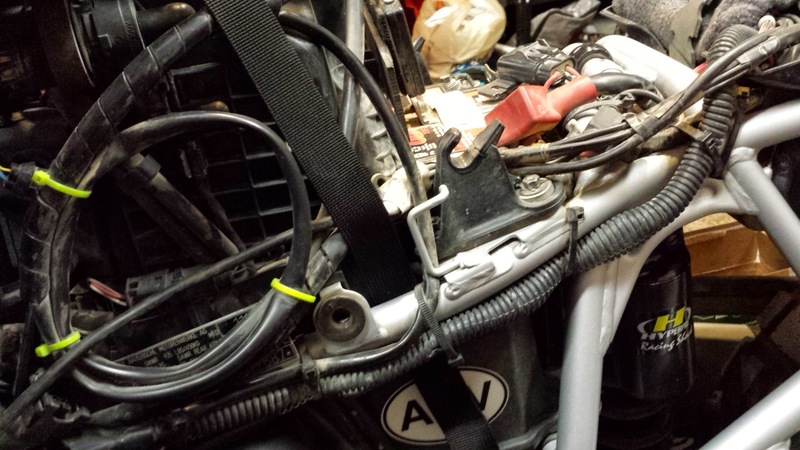 If there is a defect, we will repair or replace the Tank Bag at no charge to you. 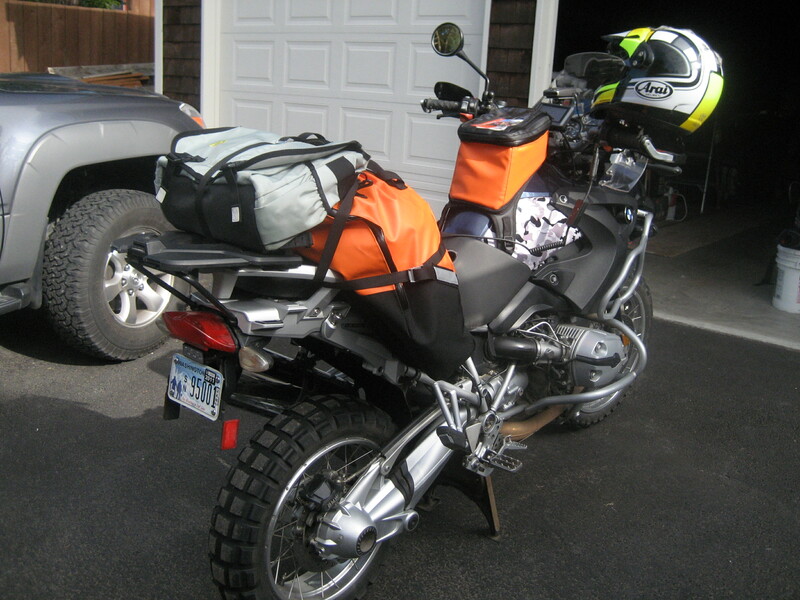 We design our adventure proof saddlebags, tank bags, tail bags, fender bags, tool pockets, dry bags, dry duffels to integrate as a modular, customizable packing system, enabling motorcycle riders to add and subtract bags to adjust for bike type, riding conditions and gear loads. These handy charts illustrate how all of the components fit together.